EZ Fusion Pre-Folded Tape Extensions are made of the finest Platinum Grade 100% Human Indo-European Virgin REMY Temple Hair. EZ Fusion Tape on Hair Extensions packs contain 24 pre-folded 3" wide extensions, 18" long, in a natural body wave. EZ Fusion Tape Hair Extensions firmly hold on to your hair with our exclusive Ultra Grip Fusion Tape. Ultra Grip Fusion Tape has the strongest yet most gentle hold on even the finest hair! EZ Fusion Tape-in Extensions are the easiest hair extensions to install. A full installation can be made in less than 30 minutes. EZ Fusion stays in up to 3 months, and is reusable up to 4 times! You only need one pack of EZ Fusion for an average installation. To order your very own amazingly easy to use 24 piece set of EZ Fusion Extensions, please chose your hair color below. 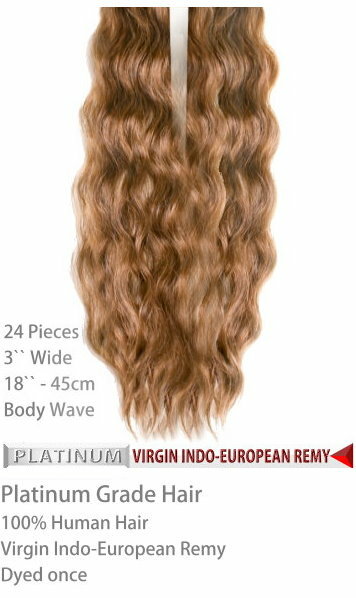 Return and Exchange Policy ER Extensions is convinced you will fall in love with the magnificent quality of our hair extensions! ER Extensions ensures you receive the highest quality hair extensions free of any defects. If for any reason whatsoever you are not happy with your purchase you can exchange unused sets of Extensions for FREE for up to 7 Days after receiving your package without any Restocking Fees . The returned extensions must be eligible for exchange as per our exchange policy below. Shipping charges will be applied. ER Extensions ensures that every customer receives brand new extensions with every purchase. Exchanges or returns therefore are only accepted for unopened packages. ER Extensions is not offering a "try before you buy" service. If you try your extensions and then send them back we are not able to resell them. You can open the flap on a pack of extensions to feel the ultimate quality of ER Extensions. Compare your hair color to the extensions through the crystal clear bag. Exchanges Procedures: ER Extensions will waive all Restocking Fees associated with eligible exchanges. No exchanges will be accepted for extensions which have been tried on or used. No exchanges will be accepted for extensions that has been received over 7 days after you receive them. All exchanges must be arranged by phone at 866-788-5599 prior to sending the extensions. All exchanged extensions must be unused and resellable condition. The cost of shipping exchanges to ER Extensions and back is at your expense. We recommend shipping with a tracking number and insurance when sending items back to ER Extensions. All Products will be inspected prior to exchange for compliance with our return policy. If a product is found to be improper and not in compliance with our exchange policy, we will not be able to exchange them for a brand new set. ER Extensions will be unable to ship the same extensions back to you without receiving payment for the reshipping costs. Returns Procedures: ER Extensions will charge you a 30% restocking fee on all eligible returns.. No returns will be accepted for extensions which have been tried on or used. No returns will be accepted for extensions that has been received over 7 days after you receive them. All returns must be arranged by phone at 866-788-5599 prior to sending the extensions. All returned extensions must be unused and resellable condition. The cost of shipping returns back to ER Extensions is at your expense. We recommend shipping with a tracking number and insurance when sending items back to ER Extensions. All extensions will be inspected prior to issuing a refund for compliance with our return policy. If a product is found to be improper and not in compliance with our return policy a refund will not be issued and we will be unable to ship the product back to you without receiving payment for the reshipping costs. Chargeback Policy Unfortunately, some customers will fraudulently charge back illegitimate transactions on their credit card instead of following our return policy. In these cases, we provide proof of delivery to the credit card company and we always win the chargeback. Once a chargeback is submitted, we can no longer help you in regards to any matters as it relates to our return policies. Other chargebacks may be turned over to a collection agency as an unpaid debt. If the balance can not be collected, the collection agency submits the amount due to all three major credit bureaus, file a small claims law suit, contact the customer at his or her place of business, or even send notice to the customer’s local police department. ER Extensions will prosecute any unpaid balances from the fraudulent use of chargebacks. ER Extensions is not responsible for any damages caused to your hair, to your client’s hair or to the extension hair as a result of misuse, abuse or improper installation of the extensions.